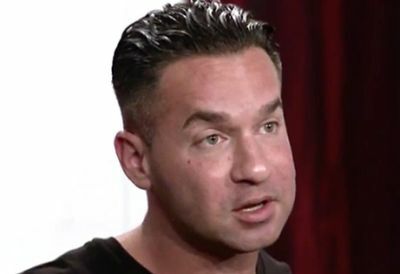 Mike “The Situation” Sorrentino is opening up about an addiction to prescription pain killers that he says practically destroyed his life. The reality star, who shot to fame on MTV’s Jersey Shore admitted to People magazine that he checked into rehab for a second time after suffering a sobriety relapse in 2015. He is now 18 months sober. Mike, who is set to appear on Marriage Boot Camp Reality Stars: Family Edition, spoke with the magazine about his years-long battle with a pill addiction. To deal with the stress, Mike said he started working out, but after cracking a rib in June 2015, he was prescribed painkillers. Mike, who went to rehab in 2012 to deal with an addiction to Oxycodone, says that this is what triggered his relapse. Based on the dates given by Mike, he was still sober while filming ‘Marriage Boot Camp: Reality Stars’ Season 5, but fell off the wagon while the season was airing. He says he now has 18 months sober, which puts his sobriety date somewhere in October 2015. According to Mike, his addiction issues put a wedge between him and his family. He told the magazine that filming ‘Marriage Boot Camp Reality Stars: Family Edition’ was stressful but it ultimately helped his relationships with his family and fiancé. Mike may be clean, but his troubles are far from over. Earlier this month, he and his brother Marc were each hit with new charges (in addition to the charges already pending against them.) Both brothers are charged with conspiring “to defraud the United States by not paying all federal income tax owed on approximately $8.9 million that Michael earned between 2010 and 2012,” according to Page Six. If Mike and Marc are convicted on all charges, they face some serious prison time. Mike could be sentenced to up to 15 years in prison, while Marc faces 25 years. Mike will discuss all of his issues when he stars alongside Marc and their other brother Maximo on ‘Marriage Boot Camp Reality Stars: Family Edition,’ which premieres Friday on WEtv. Feels like this is BS, dude just wants to stay relevant. I feel like these charges have been “pending” forever. It doesn’t take that long. He was the wealthiest out of all of them when the show was on. He had endorsements everywhere, no surprise that he wasn’t paying the taxes on it. I cracked two ribs as a child and got zero painkillers. Was supposed to take 6 weeks to heal, but fell from my bike so it became 10 weeks. Did it all on some aspirine the first night and that was it. Tell me, why does a grown man need oxy for a cracked rib? Is that a cultural difference or is he just making up an excuse instead of admitting he was shopping for polls? I cracked two ribs a few years ago from falling of a bike (a tree root on a bike path). I couldn’t even breathe without being in excruciating pain for four weeks. So maybe the severity of the fracture is the difference in the pain level. Oh damn, not being able to breathe normally for four weeks? For me it was only about four days I couldn’t take a normal breath, but I couldn’t laugh, yawn or sneeze for weeks. Still it’s weird he got serious (addictive) pain meds for it. Yeah I had a herniated disc and they gave me a freaking hot water bottle and told me to take three tylenol at a time due to dbags abusing prescription pills. Spent a year on the floor on my back with the cat at my side watching Bering Sea Gold. Finally after repeatedly prescribing me antihystamine anti-inflammation meds (that I am highly allergic to) I was able to schedule a steroid shot. They messed that one up so another 3 months later they were able to get me in. That shot saved my life and my marriage. It was a year and a half of hell in constant banging pain and allllll thanks to others abusing prescription medicine. Pisses me off. Well said! I cracked a tooth all the way to the root. All I got for the pain was motrin. The idiots abusing the drugs ruin it for the rest of us who need it. Well, at least he admitted it. Was never a fan of him back in the Jersey Shore days but part of his douchiness was because of drugs. When he came back from first rehab in the show, he was actually likable (and loved how he took the joke of singing Amy’s “Rehab” on karaoke and didn’t make a scene). Hopefully he stays clean this time. But he shouldn’t be in reality tv anymore, just live a normal life or media will make you relapse again. I agree. He was kinda harmless in comparison to genuinely rude, unlikeable, a$$hole dudes like Rahn (Ron). Vinnie was my favorite on the show. What doctor, given his previous addiction to pain meds, prescribes him MORE pain meds?! I realize he cracked a rib but cmon. My brother had Tommy John surgery where they literally sewed a ligament taken from his leg into his elbow by drilling holes in the bones of his arm and weaved it along in there, and managed the pain through Tylenol and ibuprofen. Pain can be managed without narcotics. He wasn’t/isn’t worrh 8 mil a year, he made 8 mil during those years. That was the height of JS fame. I hate to admit it but I was a faithful watcher. There are two things certain in life…death and taxes. Pay your taxes!